Are you thinking about trying a plant-based diet? Perhaps you're looking for a vegan weight loss plan to slim down or a basic vegan meal plan to boost your health. There are countless recipes and diet systems available online and in print, but not all of them are designed by a credentialed nutritionist. This sample vegan eating plan includes six days, each designed by a nutrition expert or registered dietitian. Use it to build a healthy vegan food plan that fits your schedule and your lifestyle. Before you decide to go vegan for weight loss or for better health, think about how your diet will change. Giving up dairy, eggs, and animal-based products is difficult. But if you're a carnivore, giving up meat can present a unique challenge. "Meat is rich in every way. It can be deeply satisfying and sating," says Annie B. Kay, a licensed integrative registered dietitian. Kay promotes an individualized version of a plant-based diet at Kripalu Center for Yoga & Health, where she is the lead nutritionist. She says that meat helps prevent hunger and also contains fat, which carries flavor and provides satisfaction. "When people go cold-turkey, they miss meat and even feel withdrawal from the flavor, mouthfeel, and extended satiety. They can get hungry in a deeper way initially, and it can take a bit before the wonder of fiber and plant protein kicks in, and people find the right balance of fats, fibers, proteins, and nutrients." So while the idea of adopting a vegan meal plan is often appealing, the reality of maintaining the lifestyle may be more challenging than you expect. But you don't have to go all in right away. Small steps towards a vegan lifestyle may work better. Evaluate these sample vegan meals created by credentialed nutritionists. Think about whether the program would be sustainable for you. If you don't think eating vegan every day is realistic, then choose one or two days a week to skip meat and dairy. "Remember that even if you eat less meat and ramp up the veggies, you'll still gain the benefit of a plant-based diet," says Kay. Each day listed below is designed by a different nutrition expert. The days weren't necessarily designed to work together, but there's no reason not to use the meal plan that way. You'll notice that each day's plan satisfies a different type of eater. Also, you'll notice that there are only six days listed. As a vegan eater, you will probably find that you cook more often. Many of these meals can be prepared in advance so that you have two to three days' worth of healthy food. Use the last day of the week to enjoy leftovers. Do you currently eat meat at every meal? If so, then check out this sample menu by Jackie Newgent, RDN, CDN. She provides plenty of hearty meat alternatives, so that you don't feel like you are missing out. She says that the meal provides about 1500 calories, which would be reasonable for many women and even some men who are trying to slim down. Breakfast: Scrambled Mexican Tofu Skillet—“Scramble” 4 ounces of crumbed firm Nasoya Sprouted TofuPlus in 2 teaspoons avocado oil with 10 grape tomatoes, 2 chopped scallions, a pinch sea salt, and turmeric powder. Stir in 1/2 cup black beans, 2 tablespoons fresh cilantro leaves, 8 organic blue corn tortilla chips, and serve with 3 tablespoons salsa verde. Instead of coffee, enjoy black tea with a lime wedge. Lunch: Stuffed Hummus Pita Sandwich— Use 1 large whole-grain pita and stuff with 1/2 cup hummus and a mixture sliced tomatoes, cucumbers, red onions, and baby spinach. On the side, have 1 cup berries or mango pieces along with green tea garnished with fresh mint. Dinner: Open-Face California Vegan Burger—One Organic Shiitake Mushroom Sunshine Burger patty on a half of a sprouted whole grain bun with 1 red onion slice (or caramelized onions), 3 avocado slices, and a half cup microgreens. On the side, have a thick-sliced olive oil-roasted cauliflower “steak” with rosemary and sea salt and 1 cup of steamed spinach with a lemon wedge. If you get hungry between meals, Newgent says that you can enjoy a snack-in-a-glass and stay within the 1500 calorie count. Simply combine 1/3 cup KIND Healthy Grains Peanut Butter Whole Grain Clusters with 1/3 cup plain plant-based yogurt or mashed banana. If you currently eat a lot of dairy foods (milk, cheese, yogurt), then this day's vegan eating plan might appeal to you. The meal plan by certified nutritional chef Melissa Eboli provides complimentary plant-based foods like coconut milk. Breakfast: One-quarter cup rolled oats made with 1 teaspoon flax and chia seeds, 1/2 cup mixed berries, 1 ounce of walnuts, and 1 cup of vanilla coconut milk. Lunch: Curried tofu salad with Veganaise, black beans, celery, and red onion on a coconut paleo wrap. Dinner: Four ounces of grilled tempeh topped with vegan barbecue sauce. One cup of quinoa mixed with a cup of raw red peppers and steamed broccoli. Dessert: Vanilla coconut yogurt topped with vegan chocolate chips, pecans, and cinnamon. If you enjoy bread, pasta, and other starchy foods, you'll have to be careful about your choices when you go vegan. Many of those products include dairy and eggs. Andrea Johnson, RD, CSP, LDN put together this alternate vegan diet plan that helps you make smart vegan-friendly choices. She replaces typical bread-y foods like a croissant for breakfast, pizza and cookies for lunch, and breaded chicken nuggets for dinner with foods that fit into a vegan eating plan. Dinner: Open-faced veggie or soy burger on half of a dairy-free bun with carrots or a salad with dairy-free croutons and a balsamic vinaigrette. Andrea says that to be nutritionally adequate, this menu should probably be supplemented with a snack of nuts to provide more iron and protein. It should also include more calcium and vitamin D in the form of an alternate beverage, such as fortified coconut milk, cashew milk, or almond milk, which are all relatively low in calories. Liberal snacks and sides of fruits and vegetables should be allowed to help with satiety. 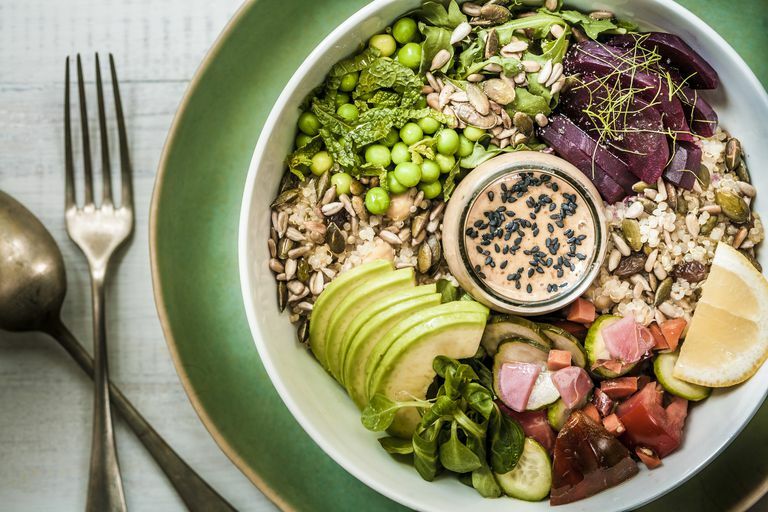 This sample vegan diet plan by Sarah Heckler, MS, RD, LDN, CISSN will keep you satisfied if you typically snack on foods that are crunchy, savory, salty, and full of flavor. The wide variety of whole, fiber-rich foods will fill you up and help curb cravings. Lunch: Salad with 2 cups spinach, 1/4 cup chopped bell peppers, 1/4 cup dry roasted chickpeas, sliced cherry tomatoes, and butternut squash noodles. Dress with oil and vinegar. Dinner: One cup Sweet Potato, Black Bean, and Quinoa Chili topped with 2-3 tablespoons sliced avocado. Do you like sweet and savory foods like caramel and chocolate? This vegan diet plan by Molly Cleary, MS, RD, CDN, CNSC provides foods that are likely to make you happy. Nut butter, creamy tahini, popcorn, and trail mix pair a crunchy and creamy consistency with a hint of sweetness to keep you happy. If you include toast (or any bread in your vegan diet), you'll have to choose one that is made without eggs or dairy. Cleary explains that not all loaves of bread are vegan, so it's important to check the ingredients for animal products before making your selection. She suggests trying Ezekial whole grain bread or a vegan-friendly multigrain bread from Trader Joe's. This vegan diet plan by Maegan White, MA, RDN provides many foods that may look familiar to you if you eat a standard American diet. Foods like cereal and toast can be included in your eating plan as long as you shop carefully and choose foods without animal, dairy, or egg-based ingredients. Breakfast: One slice whole wheat toast with a half tablespoon almond butter. One ounce whole grain ready-to-eat cereal with a cup sliced strawberries (or favorite fruit) and 1 cup soy milk, calcium-fortified. Lunch: One whole-wheat tortilla for a burrito or taco. Fill with 1/2 cup refried vegetarian beans, 1/4 cup salsa, 1/4 cup lettuce, 1/4 cup chopped tomatoes. Enjoy with 1/2 cup baby carrots (or your favorite vegetable) with 1 teaspoon olive or flaxseed oil and lemon juice drizzled on top. One cup orange juice, fortified with calcium. Afternoon snack: One half ounce unsalted cashews (or favorite unsalted nut), cup dried apricots (or favorite dried fruit), one cup soy milk, calcium-fortified. Dinner: Combine one cup tofu (calcium-set), one cup kale or spinach, 1/2 cup red pepper strips (or favorite raw vegetable), with 1 cup brown rice and 2 teaspoons olive oil. Enjoy 1 cup cubed cantaloupe (or favorite fruit). Remember that when you start a plant-based diet, food quality matters. If you're starting a vegan meal plan to lose weight or simply to feel better about your body, studies have shown that you're more likely to achieve your goal if you choose whole foods that are less processed. Enlist the help of a registered dietitian, take a cooking class, or invest in a vegan cookbook to learn how to prepare and eat nutritious foods so that you stick to your program and turn it into a healthy and satisfying meal plan for life. Satija A, Bhupathiraju S. et al. Healthful and Unhealthful Plant-Based Diets and the Risk of Coronary Heart Disease in U.S. Adults. Journal of the American College of Cardiology. 2017;70(4):411-422. Turner-McGrievy G, Barnard N, Scialli A. A Two-Year Randomized Weight Loss Trial Comparing a Vegan Diet to a More Moderate Low-Fat Diet*. Obesity. 2007;15(9):2276-2281.